Rabindra Commarasamy Tampoe, or Robin Tampoe was an all-round film personality who made a significant contribution to Sri Lanka's Sinhala-language cinema. Born in Jaffna on the 29th December 1930, R.C. 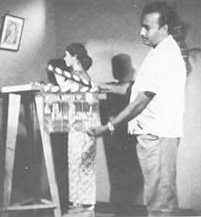 Tampoe began his film career at the age of 25 years and directed and produced 15 films in Sinhala between 1958 and 1974. His works take on more significance when one considers that Tampoe was one of Sri Lanka's rare indigenous Tamil filmmakers who catered for the island's Sinhala majority. Robin Tampoe had given up law studies to go into film. Cinema was already running in the family and Robin's own interest in cinema derived from observing his father, W. M. S. Tampoe who was also pioneering Sri Lankan film director and producer. and the beginning of the movement towards the indigenization of Sinhala cinema on the other, marked by the entry into the cinema sector of a number of GFU-trained directors and documentary filmmakers. After a co-production with his father, Sepali (1958), a Sinhala film which was shot entirely in India, Robin branched out on his own to begin a series of films using local talent and resources. Relocating in Sri Lanka coincided with the 1960 ban on making Sinhala films in India. A number of actors, actresses, music directors and cameramen took their first steps under Robin Tampoe. Robin Tampoe shot resolutely in the entertainer mode. Most of them were box office hits, and bear the stamp of his own particular style. Tampoe's activities went beyond direction and production and included the importation, exhibition and distribution of foreign. In addition, he owned a number of cinemas in Colombo and other provincial towns, including the Vilasnee Cinema Wellampitiya, and the Regal Jaffna. The advent of television and digital formats as well as political instability in Sri Lanka forced Robin Tampoe to attempt television series, but his projects were abandoned due to the onset of the ethnic war.